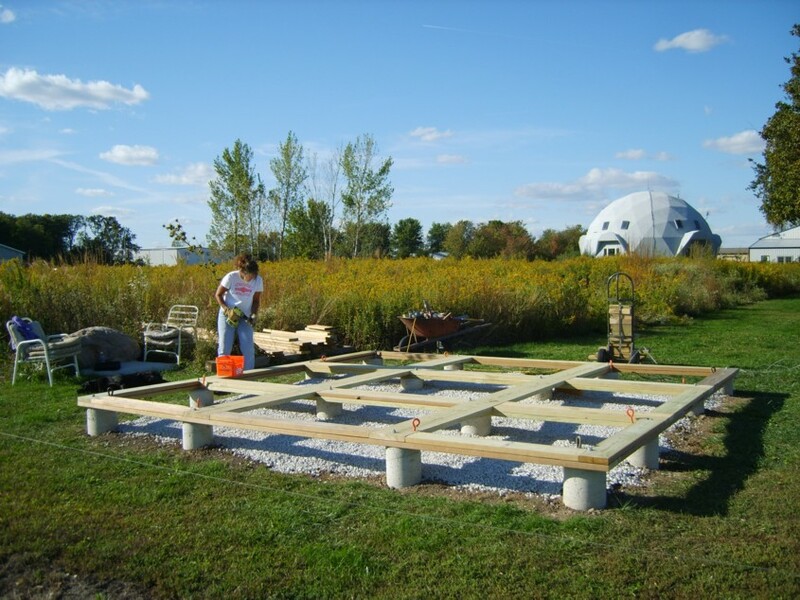 This base is made with treated lumber and stainless steel screws. This substantial base measures 16 feet by 16 feet. 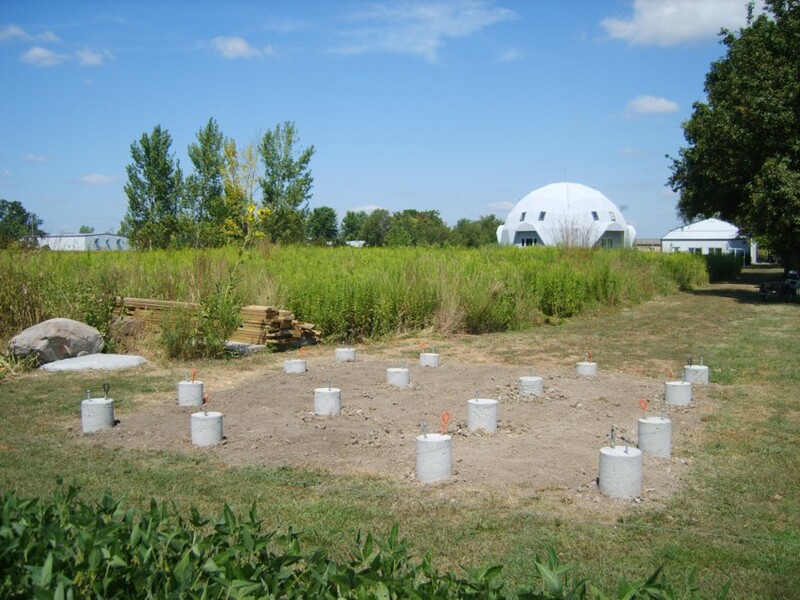 The objective of this base may be used to secure a dome or a wind power tower. Anchors embedded within the concrete piers are used to anchor a dome or a wind power machine. Below you can see a photo of a VAWT installed with Wil's dome home in the background. 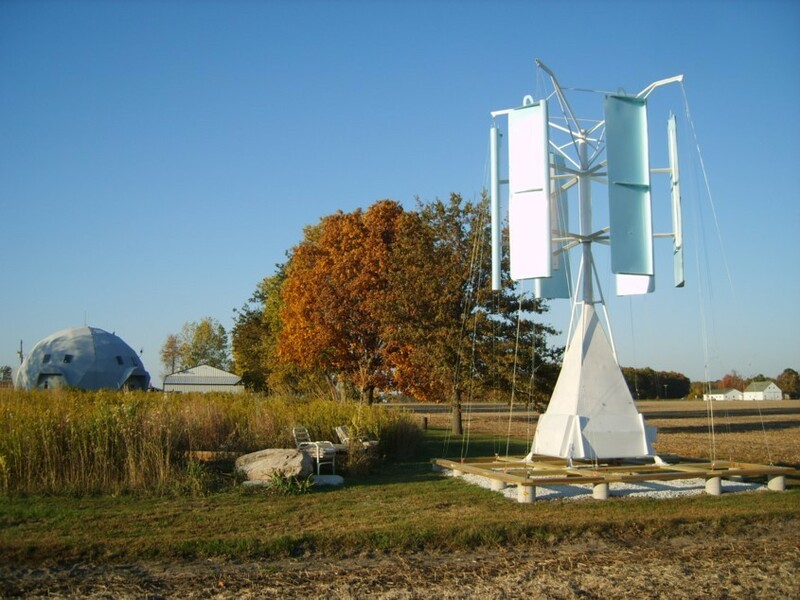 This VAWT (Vertical Axis Wind Turbine) is located adjacent two large farm fields and a 1.5 acre prairie. This is a photo of an operational VAWT with a 10' diameter x 10' high URA. This Upper Rotational J-Sails Assembly is unique in that it creates a lot of torque. 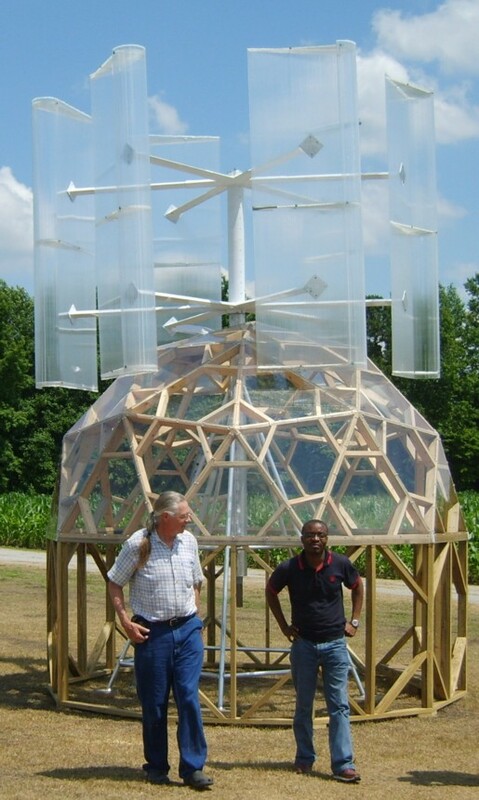 Search 'Lenz Turbine' if you want to build a turbine like this yourself. 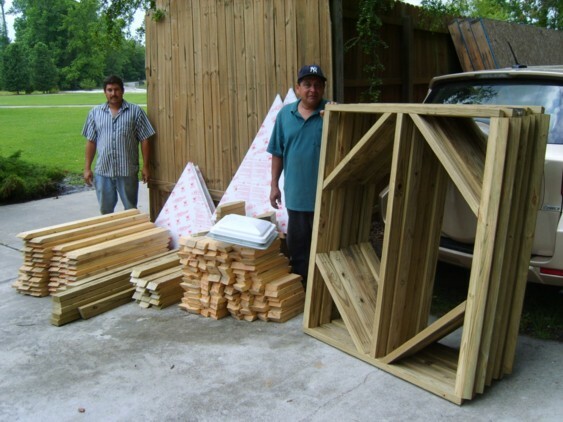 Faze Change Produx been manufacturing EconOdome Kits for more than 30 years. 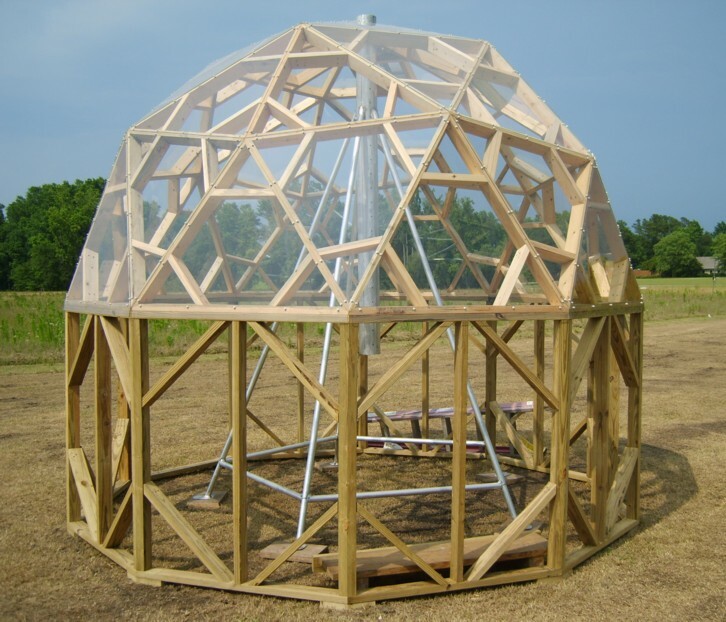 Sturdy domes built with EconOdome Kits may be used to live in or to store wind and solar power equipment. A dome at the base of a wind power pole or tower creates multifunction enclosed working and/or living space. Precision-cut EconOdome Kits have ten equal sides to make building a dome easier. The exterior EconOdome surface may be insulated and sealed many different ways. This is a photo of a 10' dia. x 10' J-sails wins power unit mounted on a dome. that can be located anywhere the wind blows. This is the 16' dia. x 14' high J-Sails VAWT unit. 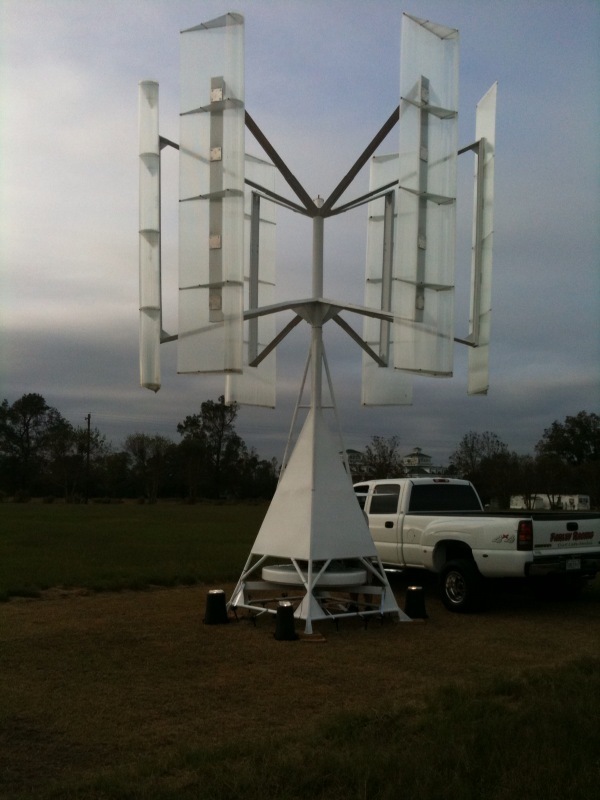 Ideal locations for mounting a wind power machine include: a dome roof or an open field. The photo above shows a complete frame kit with polycarbonate triangle panels and prefab lower perimeter walls. The exterior surface may be sealed using a UL approved commercial waterproofing system. The 13 foot diameter dome shown in the photo below is clad with polycarbonate for demonstration purposes only. If you desire more interior space, the dome enclosure may be larger. Available sizes are 13, 24, 30, 38.5, 48, and 58 feet in diameter. See www.econodome.com for dome kit pricing and details. The 16'x 16' pier and treated lumber base may made larger, if desired. An EconOdome kit designed and sized to fit your application. living and/or working space directly beneath a wind power turbine. See www.econodome.com for details and pricing. 1. Dome shaped buildings, built with EconOdome kits, are round and aerodynamic in shape (for better wind). 2. The EconOdome building is elevated by increasing the height of the supporting perimeter walls. ------This both increases the useable space within the dome building and elevates the wind turbine (for better wind). with lapping TPO shingles to create a durable and smooth surface. ------due to the roof effect (for better wind). 5. Mounting a wind turbine above a dome building also creates useable living or commercial space (dual purpose). 6. Dome shaped buildings are extremely strong and provide a safe and secure mounting location. ------because of the way an EconOdome kit is assembled and sealed, the VAWT can be securely bolted in place. ------that produce their own power--make sense in our ever changing world. Has this website helped you with ideas? Send postal mail to Faze Change Produx, 1331 CR 1470E, Sullivan IL 61951 USA.